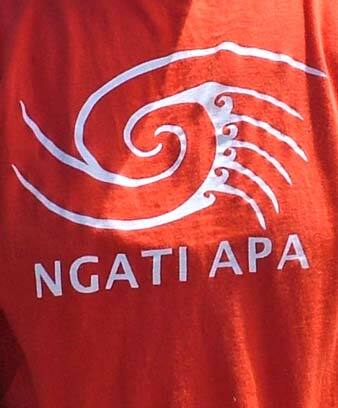 The people of Ngāti Apa live in the Rangitīkei region in the North Island. In the 19th century the tribe became known for its prophets and visionaries, who set up enduring Māori faiths, notably the Māramatanga movement and the Rātana Church. The Whanganui River marks the north, and the Manawatū River the south of Ngāti Apa’s territory. Their traditional lands lie between the Mangawhero, Whangaehu, Turakina and Rangitīkei rivers. Ngāti Apa trace their ancestry to Ruatea, captain of the Kurahaupō canoe. They take their name from Ruatea’s son, Apa-hāpai-taketake (Apa), who lived near Pūtauaki (Mt Edgecumbe) in the Bay of Plenty. Over time, some of Apa’s descendants moved south to the Rangitīkei area. Others migrated even further south, some reaching the northern part of the South Island. Those who went to Rangitīkei intermarried with the Ngā Wairiki people, and eventually became known as Ngāti Apa. Ngāti Apa were initially receptive to Europeans. They signed the Treaty of Waitangi in 1840 and welcomed missionaries working in the Whanganui and Rangitīkei areas. In 1849 the tribe sold land to the government, expecting trade and other benefits. However, these benefits did not eventuate. European farming destroyed traditional food-gathering sites. Eventually Ngāti Apa lost much of their land and were reduced to poverty. Facing so many difficulties, Ngāti Apa started several new religious movements. The prophet Mere Rikiriki inspired some important religious leaders, including Hōri Ēnoka (Mareikura), founder of the Māramatanga movement, and Tahupōtiki Wiremu Rātana, who established the Rātana Church. Today the tribe is represented by Te Rūnanga o Ngāti Apa. This organisation researches tribal land claims made to the Waitangi Tribunal, and organises health education. Restoring the tribe’s unity and prestige remains a central aim. In 2013, 3,813 people claimed descent from Ngāti Apa.